Paula Olinger, Founder of El Centro, Retires in May | The Gettysburgian. Paula D. Olinger, Associate Professor of Spanish at Gettysburg College will be retiring this year, after almost 40 years of teaching. Olinger joined the college’s Spanish faculty in 1979 and received her PhD from Brandeis University in 1986. During her time at Gettysburg, she has advocated for service learning and social justice. Olinger specializes in Spanish literature, especially women’s poetry, but Don Quixote holds a special place in her heart, and on her bookshelf. A native to Gettysburg, Olinger married a Spaniard when she was 19 and moved to Spain, under the Franco regime. Olinger studied at the University of Barcelona and experienced the terrors of Franco first hand. After that, Olinger knew that this was not the world she wanted to live in. In the summer of 1984, Olinger was made aware of a trip to Central America for educators at Lutheran colleges. Olinger jumped at the chance and found herself experiencing life in Mexico, El Salvador, Honduras, and Nicaragua. In Mexico, she was able to see the base communities that Pope John XXIII had created, as part of a series of changes, better known as Vatican II. The pope had decided that priests had to live among the poor and teach them to read the bible, which was illegal at the time. As the only visitor there who could speak Spanish, Olinger did not have to communicate through translators to hear the stories of these people from the people themselves. “That trip changed my life,” Olinger remarked. After returning from Central America, Olinger helped to develop a series of activities as part of a program called “Central America in Chaos.” The program brought famous writers, speakers, poets, and priests from Central America to speak about what life was like there. Olinger’s research focuses on poetry, currently on the poetry of women in Latin America. 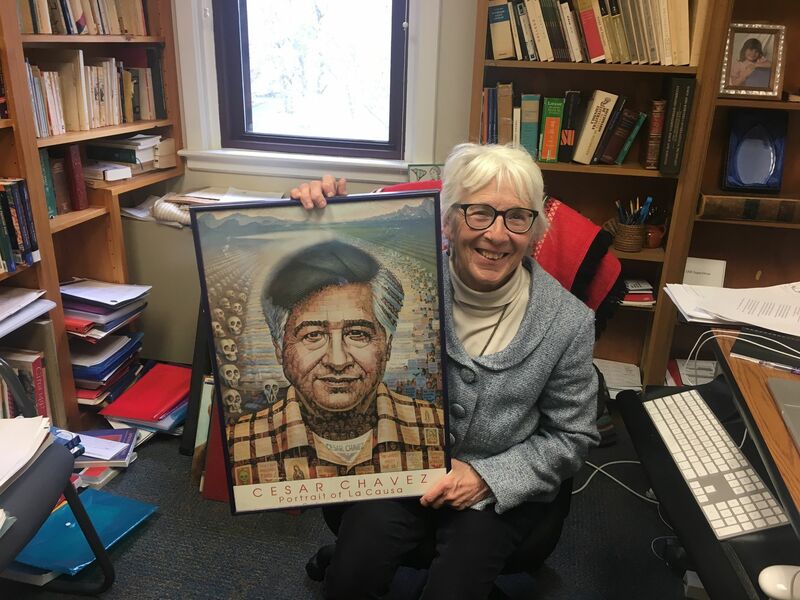 Her book, “Images of Transformation in Traditional Hispanic Poetry,” is a manifestation of Olinger’s fascination with Latin America, Spanish literature and social justice. After Olinger’s parents passed, she inherited a building in Gettysburg: the very building that she had grown up in. Her family and herself turned that building into a Bed and Breakfast. Olinger noted that this B&B was in the poorest part of the town, a part wherein which the majority was African-American families. Children who knew Olinger because of their parents, who had gone to school with her, would come to the Bed and Breakfast for some candy, and would ask for help with their homework. As Olinger started telling stories of the program to her students in her classes at Gettysburg, she noticed that many wanted to come tutor at El Centro as well. By 2002, the fourth hour program for Spanish students was up and running, and has developed more and more ever since. In 2009, Olinger was awarded the Lifetime of Peacemaking Award, highlighting her extraordinary level of empathy and agency when it comes to service learning and social justice. As she leaves Gettysburg College, Olinger keeps an open mind surrounding what is ‘next’ for her. She has ideas of creating more education programs within Gettysburg, especially a middle school program, or developing educational opportunities within prisons.